Replace your old, worn system with a new one that’s more efficient and keeps everyone cooler! Is your current AC system not doing its job? Consider replacing it with a newer, much more efficient model! Contact R&R Heating and Cooling to learn about affordable, more energy-efficient options for you! We are thorough and conscientious! Call R&R for expert AC installers in Southern California! We all know nothing lasts forever, but did the AC really have to call it quits in the middle of a heat wave? Instead of avoiding your home, turn to the HVAC company you can trust. 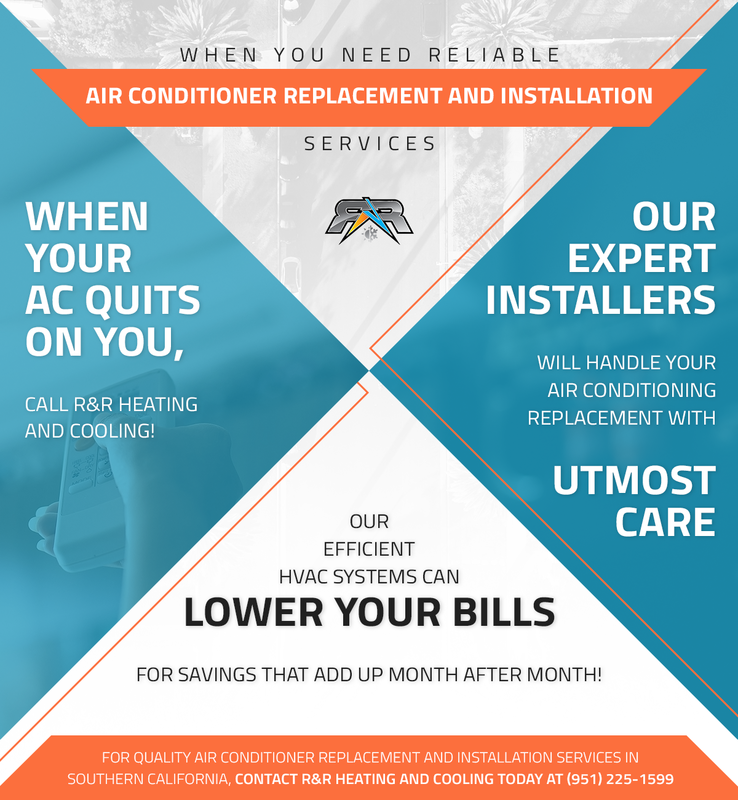 When you are in need of air conditioner replacement and installation services, there is only one team for the job: Call R&R Heating and Cooling for superior and immediate service. We have the experience to help you, regardless of your budget or the condition of your current system. We are expert installers who will handle your air conditioning replacement with great care. Choosing our team for your replacement and installation allows you to take full control of your new system. Are you worried about your utility bills? The quality of air in your home? Our professionals are happy to share with our customers the ins and outs of their new systems and explain the benefits of the upgraded model. With our commitment to environmentally friendly options, you can save money on your bills while also reducing your carbon footprint. That’s what we call a win-win. When it’s time to replace your air conditioning system, we can consult with you to determine which brands and models might work best for your specific needs. As HVAC contractors serving Southern California’s coastal and inland communities, including Palm Springs, Temecula, Anaheim, Irvine, and more, we have a good sense about which systems and units work best in our climate, while serving as energy-efficient choices that bring down your monthly expenses and are gentler on the environment, too. Not only are our professionals passionate about keeping your home cool, but they also care about being among the best HVAC contractors in the region. R&R Heating and Cooling employees are all NATE-certified and constantly receive updated training. 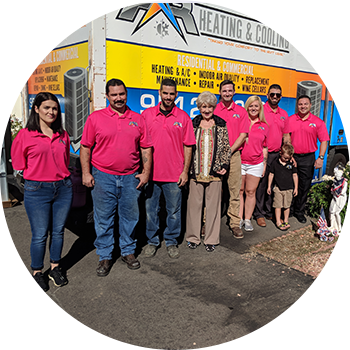 Each of our team members is properly licensed and insured, so you can rest assured that the new air conditioning system we install for you is of a high quality, and that our talented technicians will complete the job for you right the first time. There is nothing more frustrating than having to hire other HVAC contractors to fix what the original ones tried to do but did incorrectly. With R&R Heating and Cooling, you won’t have to worry about this scenario, because we are dedicated to doing the job right the first time around. We firmly believe that a high level of professionalism should be the norm in our industry, so we make no exceptions to our standard. Experience the difference working with true professionals can make in Irvine, Anaheim, Palm Springs, and Temecula. For all your HVAC repair, maintenance, and installation needs, reach out to our company to schedule an appointment today!